RANGER-Inkssentials Inky Roller Brayer. 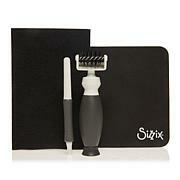 Small Inky Roller brayer system provides you with the ultimate in creativity and flexibility. Create your very own textured roller stamps and transfer stamped designs to paper and fabric! 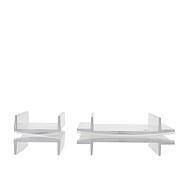 Features: Ultra-soft rubber roller, built-in footed stand, convenient hanging handle, and change rollers effortlessly. Made of metal and rubber. Color: Silver and Red. Measures: 4.75Hx3.75Wx1.0625D. Small 2.25 inch wide brayer roller. Imported. Very pleased with this great little brayer. It's sturdy and rubbery and just basically perfect. I'm so pleased with it. 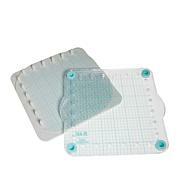 Love this for inking up my embossing folders. I have a lot of embossing folders and was using ink pads to ink them but the results were always lackluster. I decided to try this and the results are lovely! This product is thoughtfully made: easy to clean, has tiny legs to keep it from touching the table, and can be hung on a hook. I don't know why I waited so long to buy this. Love this roller when doing my multimedia work! This is a must if you are an artist and do a lot of multi media work! 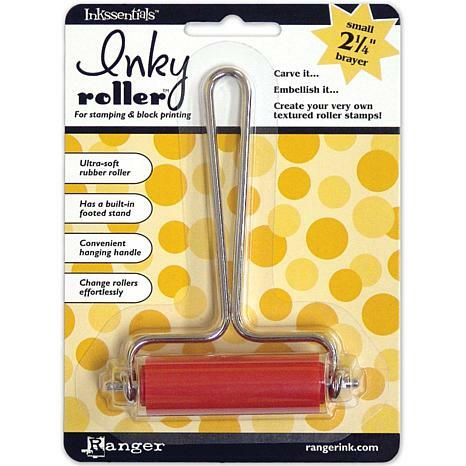 nky Roller Brayer - Small 2-1/4"
Great tool for inking embossing folders. Just the right size.